Masten Space Systems in the Mojave is working on vertical takeoff and landing suborbital rockets. Yesterday they flew to 444 meters. I swear the landing looks like the launch run backward. That’s smooth! The most awesome thing you will see today! Yep. 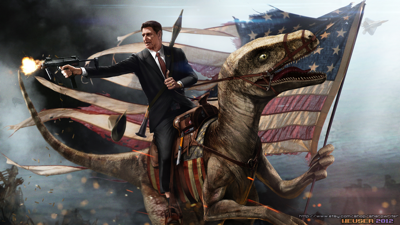 Ronald Reagan, riding a freakin’ velociraptor! Credit, and where you can get copies. You are currently browsing the The Old Gray Cat blog archives for the day Thursday, July 5th, 2012.